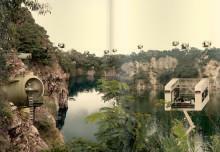 Frieze tent, designed by SO-IL, Aerial View, photography © Iwan Baan. 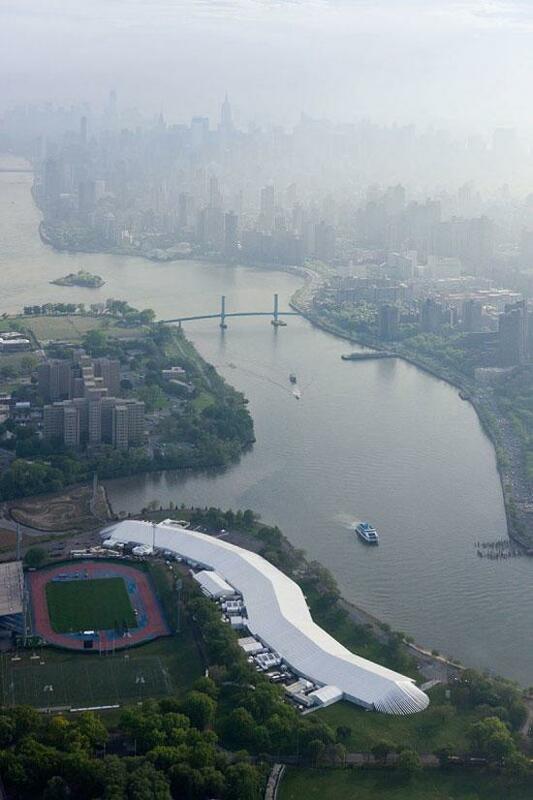 Randall’s Island, situated between Manhattan, Queens and Bronx hosted the inaugural Frieze New York event. 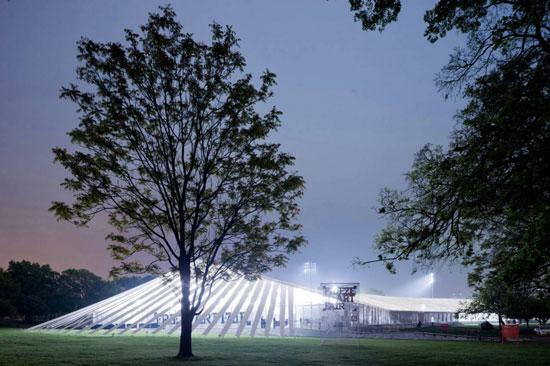 Formerly having hosted an orphanage, poor house and reform school and being one of the few open lands in New York City of that size, Randall’s island was selected to accommodate the temporary installation for the renowned art fair running in London since 2003. 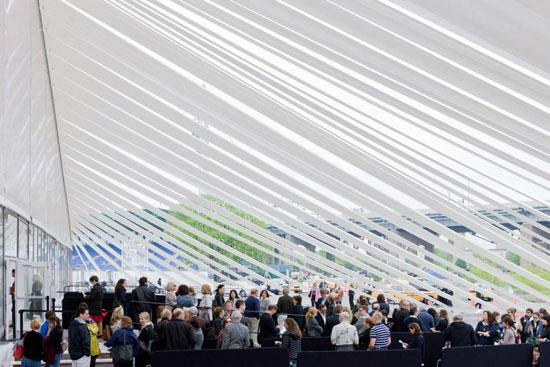 From its inception, Frieze builts on bespoke uniquely designed spaces to host their events, commissioning a series of recognized architectural firms: Carmody Groarke (2011), Caruso St John (2008-2010), Jamie Fobert (2006–2007) and David Adjaye (2003-2005). Following their approach to invest in forward-thinking design, they chose to work with SO—IL, New York based architecture firm, for the New York inaugural edition. 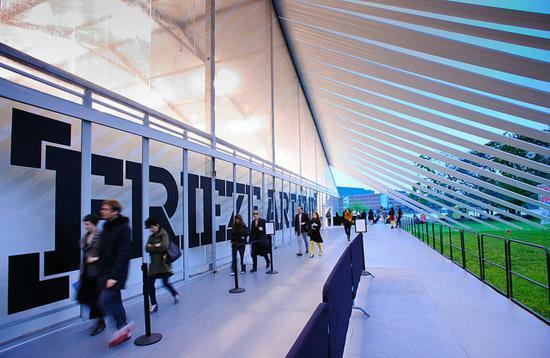 Frieze tent, designed by SO-IL, North Entrance, photography © Iwan Baan. 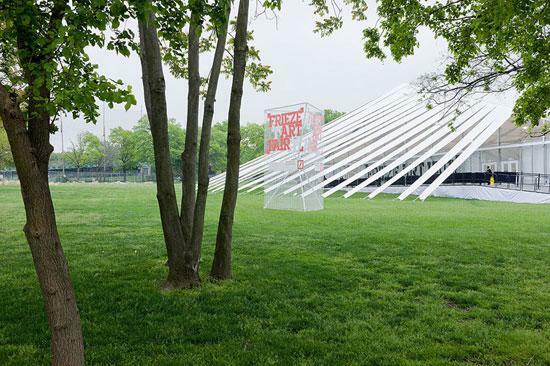 SO—IL, Florian Idenburg and Jing Liu, devised a playful and inventive approach to the otherwise rigid and somewhat dull structure of prefabricated tents. 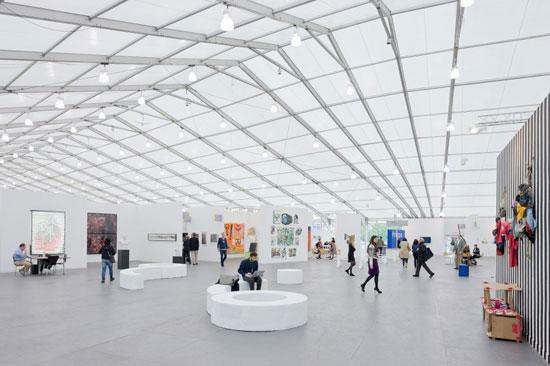 Manipulating this inflexible linear shape, they managed to create a temporary structure that is able to amply accommodate the 180 booths of the world’s top galleries and parallel activities of the art fair, and at the same time establish itself as an icon. 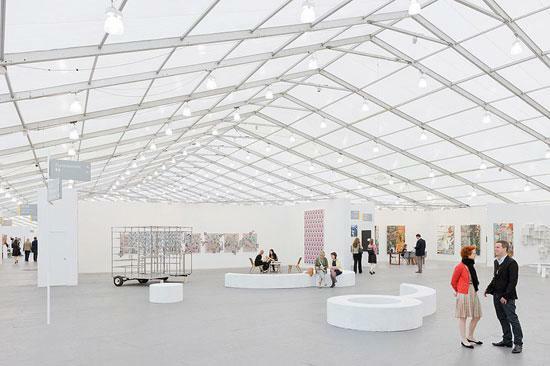 Frieze tent, designed by SO-IL, Interior View, photography © Iwan Baan. 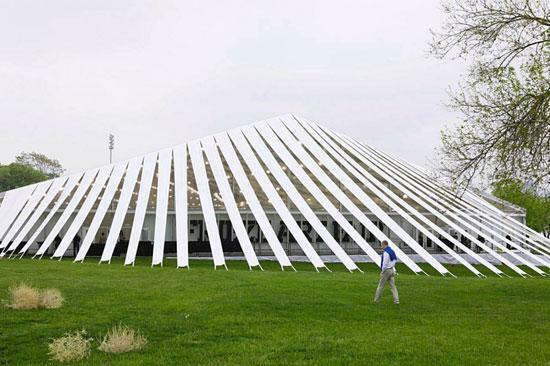 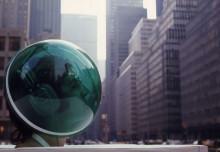 Frieze tent, designed by SO-IL, South Entrance, photography © Iwan Baan. 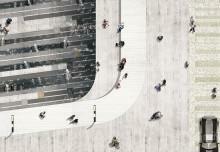 By intersecting pie-shaped tent section wedges into a set of six tent sections, they created a snake form structure that follows the East-side waterfront shape of the site on the outside, while organizing the interior space into more manageable divisions. 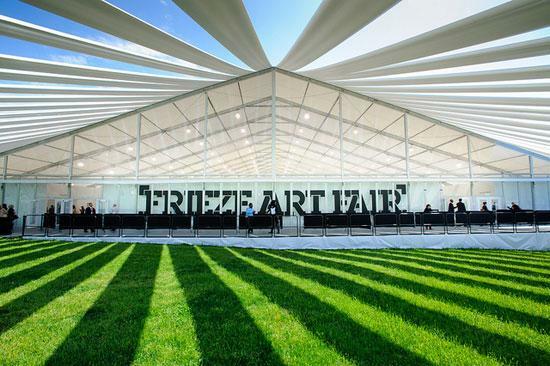 This gigantic 225,000sf, 1500 ft installation gracefully dissolved into the ground by extending the roof fabric in stripes at both ends of the tent, creating also a playful transition to the interior space of the fair.